Everyone by now has heard and seen this story, seen the disputes over who did what, who was the victim. These children are an example of what unconscionable, rich, greedy, arrogant adults produce. Sickening. Gronda has done what I couldn’t even start to do in writing a post about this situation … please take a moment to read her excellent work. Thank you, Gronda, for I couldn’t even tackle this one just yet. This entry was tagged Covington Catholic High School, disrespect, Donald Trump, Nathan Phillips, Nathan Sandmann, Native Americans, Nick Sandmann. Bookmark the permalink. My take on this, Is that there were three confrontational groups involved here, all with somewhat different agendas. Video clips and photos do belie intent but not necessarily the whole energy of a situation. It is no illusion. The Catholic School kids were riled up, chanting and goading the before Nathan Philips (The Native American) cut a path through the sneering amused kids who, as kids will do, make a situation work to their advantage. Nick Sandmann was initially sarcastically smiling at Nathan Philips and blocking his route through the now subdued and confused kids who did not seem to understand completely how to deal with the situation, but continued to blag it anyway. Nick Sandmann clearly uncomfortable, but not wanting to be the one who looked away first. Later in the clip, it is obvious that the boys Tring to defend Sandmann are riling up other Native Group members, and there does seem to be an attempt by Sandmann to silence the other boys as he clearly has lost the staredown and doesn’t want it to get any worse. This, no doubt, will be his line of defence. The Isralite supporters were aggressive and so were some of the Native American drummers. The situation deteriorated rapidly. Sandmann was wrong to try to use a typical bullying tactic used by kids when in face offs. Smile a psychotic, crazed smile at your oppenent to make him act aggressively! Sandmann got exactly what he wanted but It went badly wrong. And Sandmann eventually had to walk away as the cameras snapped and his friends took abuse. He obviously felt that he was now out of his depth as the kids all moved away from the now angry adults. There are all kinds of reasons why these kids should never have been in this situation unsupervised. Potentially, it could have had a worse outcome than it did. I believe there were many people at fault here for the escalation of tempers, but Sandmann could have prevented the confrontation simply by stepping out of the way, as Gronda suggested. He chose not to, and for that, he will bear some consequence, probably amounting to a suspension from school. Interesting take on all of this. This incident has been another divisive issue, then again isn’t most everything these days, but a few things stand out to me. Catholic school students wearing MAGA hats and sneering in an elder’s face hardly makes anyone of them great, much less America. Add to that, Trump’s invitation to these students to visit the White House sends a message, to all young people, loud and clear…white is right, any other color skin is not worthy of consideration or respect. 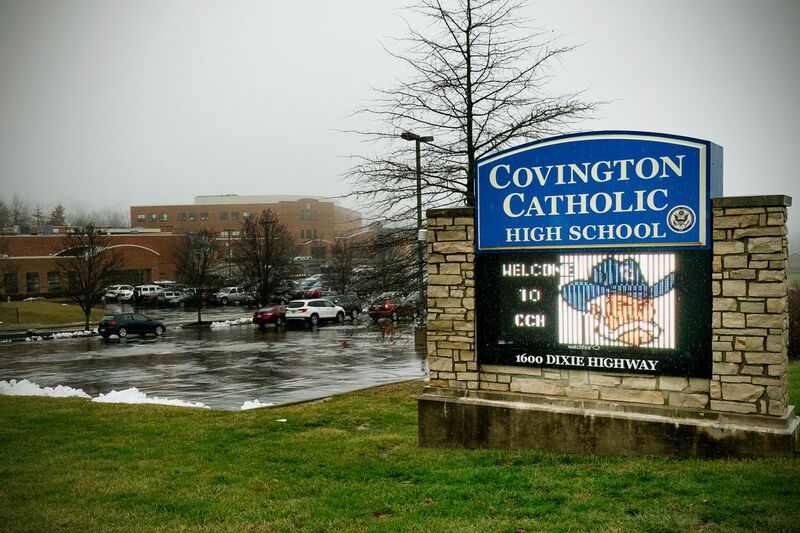 These parents have failed and the teachings of Covington Catholic High School have failed, unless this is exactly what they want these kids to learn…HATE! Thank-you Gronda for this fact based post and Jill for sharing!! The incident is yet unclear as to who did/said what and when, but the thing that cannot be denied is that these school kids were RUDE. If that’s what their parents are teaching them, then woe to this nation. If that’s what Christianity is teaching … I can only shake my head and be thankful that I am old. But Trump’s invitation to these young brats makes me see red! He couldn’t just keep his mouth shut!!! NO, he has to use this as a platform to further advance his cause of white supremacy! Been following this story that has been twisting and turning. It’s getting to the point I’m wondering what really happen. the only impression I know is the boy is wearing a Trump hat and he loves the attention in the media. The story seems to be spinning out of control. It does seem to be spinning out of control, and with so many different versions, I’ve quit even trying to figure out what happened. I only know those boys were disrespectful. Other than that … we’ll probably never know quite what transpired. right now all they are probably doing is saving them from being put out of school… no one cares what they did to the native… Let’s Make America Great Again is more important at this time than how they make it that way. Very astute observation … I think you’re right. Everything about this makes me sick. Me too, and I suspect it isn’t going to die down anytime soon, for it is becoming an extremely divisive incident. Sigh. Dear Jerry, there are 2 sides to every story. It’s all about perspective and how it relates to our preconceived political views. I can see from the viewpoint of a veteran – much respect and thank you for your service btw – it may seem dishonorable for the Indian dude to avoid the draft. Please understand from Gronda’s liberal viewpoint, this Native American Elder was just trying to diffuse the situation and keep the peace by chanting and beating drums, just the opposite of instigating violence. Perhaps his reasons for non-violence and peacekeeping had made him a conscientious objector during the Vietnam war as well. Also, are MAGA hats part of the Catholic school’s official uniform? Yes of course they have the right to wear them, as their right to freedom of speech and expression. But there are limits, like you wouldn’t yell fire in a theatre, wearing those caps would most definitely trigger a few liberals. What Gronda is trying to say, why aren’t there adult supervision to control the situation. It seems there were a few “teachers” standing around and allowing the kids to get outta control. You did see that one kid ripping his shirt off and posturing in a confrontational way? His body language is signaling to provoke a fight. Yes there were several guilty parties involved, but the Christian “adults” could have taken control at any time and try to diffuse this unnecessary situation. That kid could have stepped back and not challenge the Elder, it’s all ego and hatred that’s stirring all this up. Often it takes a bigger man to control oneself and the situation by backing down and understanding the other person’s POV. This is a very good comment in response to Jerry’s, however I have removed Jerry’s comments because I found them disrespectful. I don’t mind disagreement, and in fact I welcome opposing opinions for it gives us a chance to learn and consider other sides. But I do not tolerate disrespect, and Jerry crossed that line. Thanks, though, for your thoughtful comment. Oh well, too bad for Jerry. Welcoming debate is wonderful, but I find it increasingly difficult to find a conservative who isn’t completely brainwashed by the Trumpmania hype. Jill and Gronda, thought you and your readers would be interested in this perspective as well on this situation. Everyone is still wrong about the Covington kids/ The Covington students failed to act like grownups. So did the adults./ Why Trump is overjoyed at the Covington student controversy./ Nothing justifies what the Covington students did. Like Gronda, I got an error message when I clicked on the link. I get that young people do stupid things but what I don’t get, is parents hiring PR firm to clean up after mess Nick Sandmann made instead of using this moment to teach their son some valuable lessons like how it is important to respect elders, how to accept responsibility and learn from mistakes, how to apologize. .It could be that he has Trumpian parents but what about the school. What kind of values are they teaching young peoples under their care? Thanks again for your support and for this reblog. It was my pleasure, dear Gronda. Yes, hiring the PR firm was an act of sheer wealthy privilege and arrogance, in my book. And Trump has invited these juvenile delinquents to the White House. Again, they are himself at that age and he is loving it. Sigh. I’m tired of this country, of it’s so-called leadership.